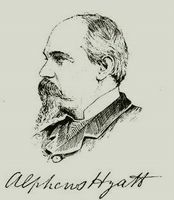 Hyatt (April 5, 1838 - Jan. 15, 1902) was a U.S. zoologist and paleontologist who studied invertebrate fossil records, the evolution of the cephalopods (a class of mollusks including squids and octopuses) and the development of primitive organisms. Along with E. Cope, Hyatt was the most prominent American neo-Lamarckian. Based on the analogy of ontogeny with phylogeny, Hyatt claimed that lineages, like individuals, had cycles of youth, old age, and death (extinction). This idea became the bulwark of orthogenetic theories in the U.S.
Hyatt was the founder and first editor of the American Naturalist, and first president of Woods Hole laboratory.